Institute for Chemical Research (ICR) has been functioning since 2010 as a “Joint Usage/Research Center (JURC)” approved by MEXT. On the basis of frontier research and extensive domestic/ international collaboration so far conducted at ICR, the JURC aims to further develop cooperative research and cultivate young researchers in chemistry-oriented fields; 68, 75, 77, 76, 98,and 104 research subjects were pursued at JURC in the fiscal years of 2010, 2011, 2012, 2013, and 2014, and 2015 respectively. The achievements of ICR-JURC were highly appreciated by MEXT on the occasion of the end-term evaluation in 2015 to receive the highest S rating. Thus, ICR has been approved as a JURC for a second six-year term starting from April 2016. For further details, click here. Cutting-edge scientific research is increasingly interdisciplinary. In order to advance and create integrated research on chemical synthesis it is imperative to have coordinated cooperation across various research fields. Our cooperative research initiative is very unique, one of a kind in that it coordinates collaborative research across four different institutions. 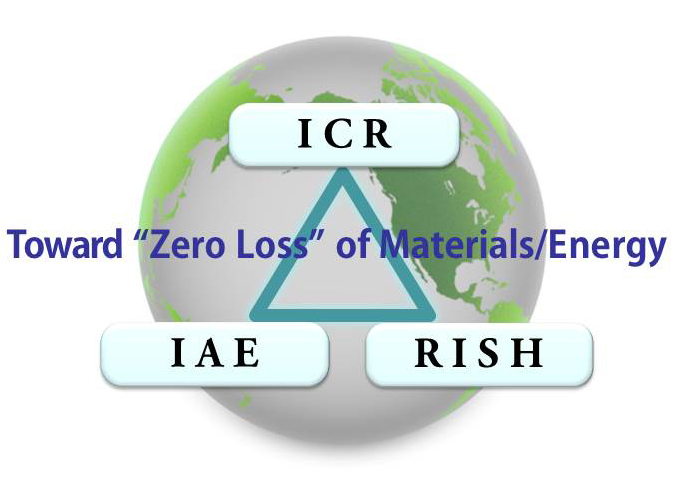 Three institutes on the cutting edge in the field of chemistry, biology, and materials science aim at creating a novel under-one-roof type of cooperative research initiative and hence bio-inspired and highly efficient “smart materials” for “zero loss” in the production/transport/use of materials and energy.